Interviewed a great person a few years ago for a business development position. When I asked her why she had been so successful, she responded, “If it is to be, it is up to me.” Best answer ever! Seems to be a lot of excuses going around these days. In the workplace, many associates seem to blame circumstances or other people for their failure to get stuff done. In government, does anyone take accountability for anything? Been stuck on a bridge in New Jersey lately? Too many examples of people making commitments that they just do not live up to. Does anyone just stand up and take responsibility anymore? How about some honesty and integrity? Pretty rare these days. What are the drivers of this behavior? Accountability starts with you. Grab a glove and get in the game! Accountability is about being reliable. Do as you say! Accountability is ownership. Own it. If it fails, fix it. Accountability creates clarity. No questions required. Accountability is about trustworthiness. You deliver, maybe others will follow your lead. Accountability is a partnership. Do you want your partners/teammates letting you down? Did not think so! Successful leaders always show accountability. And now for some comic relief from Bruce Springsteen and Jimmy Fallon. That’s A Lot of Ham for Only Two Eggs! But Nest is one of the current market leaders in what is being referred to as the “Internet of Things.” What is that you ask? The Internet of Things refers to uniquely identifiable objects, like a room thermostat or smoke detector, that are connected and accessible via the internet. Earlier examples of these “connectors” are RFID (Radio Frequency Identification) chips, barcodes, QR codes and digital watermarking. According to Gartner there will be nearly 26 billion devices on the Internet of Things by 2020. Now that is a lot of devices. A bit more about Nest. Nest is best known for its smart thermostat, which learns your habits over time and adjusts your heat settings accordingly. 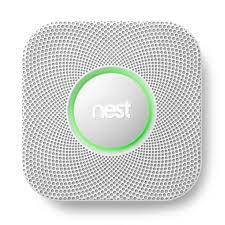 They also recently launched Protect (Smoke + CO Alarm) to rave reviews. Here are pictures of the Nest thermostat and Nest Protect alarm. Nest Protect not only has an alarm component, but also speaks to you with a human voice. It tells you what the problem is and where it is. And if you have more than one Nest Protect, they connect so they can speak up at the same time even if Wi-Fi is down. No better way to protect the home and family. For Google, this continues a big new push to apply its machine-learning expertise to physical objects, from self-driving cars to robots and now home appliances. Google continues to broaden its focus to artificial intelligence and machine learning in myriad forms. It is now a machine-learning company. We are moving into a time where the opportunity to track everything in real time on your phone or other internet connected device will be possible. When will we have the time to actually accomplish anything? 🙂 George Jetson is the man! 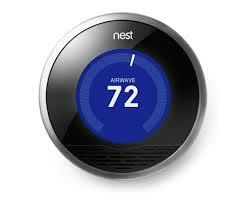 Google buys Nest: What does this mean for home automation and ‘the internet of things’? Second installment in the series from Joel Peterson, Chairman of JetBlue Airways. As we did last week, I will summarize and add some thoughts. Personal integrity is the foundation of trust in any organization. If you say you are going to do something, just do it. Don’t make your team or your manager ask you about it. Tell them it is done before they ask you. Leadership is critical. Leaders show and encourage respect when they empower team members, celebrate their contributions, and help them learn from missteps. Command and control leadership does not support building trust. Positive always beat negative. Going negative reveals a general lack of respect and self-control. Your culture will be better served by celebrating what your own team is doing. Be a leader – do not go negative! Respect is an investment. You want to build a great team based on trust? Nothing gets better results in team coherence, employee satisfaction, and organizational momentum than advancing the best interests of the your people. Root out disrespect. Vigilant leaders are always looking to nip disrespectful practices in the bud. That means no tolerance for talking behind people’s backs, letting problems fester, or failing to give people the feedback they need to improve. If this is happening, you need to act quickly and put an end to it. Respect isn’t the same as being nice. Disagreement is key yo great decision making. People in high-trust organizations feel secure in their ability to disagree – because they know how to disagree with respect.